Novica was founded in 1999 and is in association with the 'National Geographic'. For those not familiar with the site, this is the ultimate destination for unique items created by talented artists from around the world. Novica's goal as they explain it, is to: "give artists and artisans around the world a global platform to express their true artistic talents". While this marketplace has many beautiful items for sale throughout the site, their daily deal offers one unique handpicked item at a discounted price and lasts for only 24 hours. 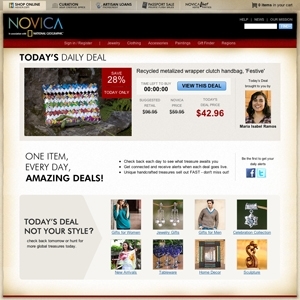 Novica.com currently ranks #56 amongst sites offering online deals -- Steepandcheap ranks #55. In the General Merchandise category, Novica ranks at #26 -- DollarDays ranks #25.